Portrait of Balakirev from the Balakirev Biography at Piano Society. Mily Alexeyevich Balakirev (Russian: Милий Алексеевич Балакирев, Milij Alekseevič Balakirev) (January 2, 1837 – May 29, 1910) was a Russian composer. He is better known today for bringing together the composers known as The Five than for his own music, with the exception of his Islamey: an Oriental Fantasy, which is still popular among pianists. As Balakirev pushed for nationalistic pride in the music of Russia without the melodic and harmonic influences from southern and western European countries, he revived a spirit in which the religion, race, ethnicity and nationality were regarded with more respect and vigor bringing greater interest of the Russian population into their culture. Moreover, as Balakirev founded the group of the Russian five composers and created a greater accessibility to music education for the populace, he thus brought a harmony between the government and private enterprises to evolve into a unique public/private cooperation. 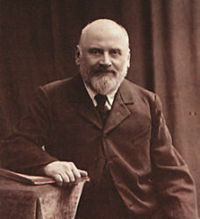 Balakirev was born at Nizhny Novgorod into a poor clerk's family. He first received a musical education at the behest of his mother, who took him to Moscow in 1847 to receive lessons from Alexander Dubuque. Money problems eventually ended these lessons and forced him to return to Nizhny Novgorod. His talents did not remain unnoticed though; he soon found a patron in nobleman Alexander Oulibichev. Oulibichev was an author of a biography of Mozart and had had a private band and a vast musical library, from which Balakirev obtained a valuable education in music. At 18, after a university course in mathematics, Oublichev took Balakirev to Saint Petersburg, and there he made the acquaintance of Mikhail Glinka. Glinka encouraged Balakirev to take up music as a career, advice that Balakirev took to heart. He made his debut in 1856 with the first movement from his Piano concerto. His meeting with Glinka also helped establish a spark of Russian nationalism within Balakirev, leading him to adopt the stance that Russia should have its own distinct school of music, free from Southern and Western European influences. Around him gathered composers with similar ideals: César Cui, Modest Mussorgsky, Alexander Borodin, and Nikolai Rimsky-Korsakov. The five men were described by noted critic Vladimir Stasov as "a mighty handful;" they eventually became better known in English simply as "The Five." The group encountered harsh criticism from the existing Russian musical establishment in the form of Anton and Nikolai Rubinstein, who publicly called the group "amateurs" (something that was not entirely unjustified, as Balakirev was the only professional musician of the group). To conteract these criticisms and to aid in the creation of a distinctly "Russian" school of music, the group founded the Free School of Music in 1862. 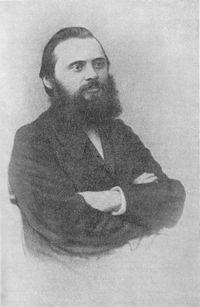 Mily Balakirev a photo-portrait, from the 1860s. Balakirev was somewhat notorious for taking long periods of time to finish works; for instance, his "Sonata in B flat minor" was written over the course of 50 years. Nevertheless, he managed to produce a large body of work, much of which is rarely performed today. His works consist largely of songs and collections of folk songs, but include two symphonies, two symphonic poems (Russia and Tamara), and four overtures, and a number of piano pieces, including Islamey: an Oriental Fantasy. His orchestral works are generally pieces of programme music in a style developed by Balakirev's disciples, such as Borodin and Rimsky-Korsakov. Islamey is particularly favored among pianists, due to its difficult nature. His influence as a conductor, and as an organizer of Russian music, give him the place of a founder of a new movement. Though he was one of the founders of the Free School, he strongly opposed what he termed "musical professionalism," qualities he associated with the established Russian music scene in the mid 1800s. He sought to imprint his vision of music onto his students, and was thus the defacto head of the five during their existence. He ruled this group often with a strong hand. Mussorgsky in particular often came under fire from his teacher; due to Balakirev's harsh criticism of his Night on Bald Mountain, the work was never performed in Mussorgsky's lifetime. Outside of the group, Balakirev also greatly encouraged Peter Tchaikovsky in his studies, eventually inspiring him to write the Manfred Symphony (something that Tchaikovsky acknowledged when he dedicated the piece to Balakirev). The Free School was influential, but suffered from chronic financial problems that drove Balakirev to a nervous breakdown in 1872. He took a temporary retirement from the musical world after this, leaving the school to become a railway clerk. He held several jobs, such as that of a school inspector, until 1883, when he was appointed director of the Imperial Chapel and conductor of the Imperial Musical Society. He held this post until 1895, when he took his final retirement. 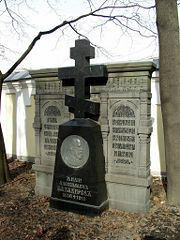 Balakirev died on May 29, 1910 and was interred in Tikhvin Cemetery at the Alexander Nevsky Monastery in Saint Petersburg. Mily Balakirev was an extraordinary force for the folk and indigenous music of Russia which he extolled in his numerous compositions. He warned musicians to guard against the free adaptation of the melodic and harmonic forms from southern and western Europe and to rely on the rich artistic resources of the area of eastern Europe and northern Asia. As the founder of the Five and the Free School in St. Petersburg, Balakirev brought nationalism and accessible education to Russia. Grande Fantasie on Russian Folk Songs, Op. 4, for piano and orchestra. Islamey, Oriental fantasy for piano, Op. 18 (1869, revised 1902). Overture on a Spanish March Theme, Op. 6. Piano Concerto No. 1 in F sharp minor, Op. 1 (1855-1856). Piano Concerto No. 2 IN E flat major, Op. Posth. (1861). Piano Sonata No. 1 in B flat minor, Op. 5. Piano Sonata No. 2 in Bb minor, Op. 102 (1905). Reminiscences on Glinka’s opera "A Life for the Czar",fantasy for piano (2nd version of Fantasy on Glinka's themes) (1854-1855, revised 1899). Scherzo for Piano No. 1 in B minor (1856). Overture on a Spanish March Theme (1857). Overture on Three Russian Themes (1858). King Lear (Korol' Lir), incidental music Shakespeare's play (1858-1861, revised 1902-1905). Mazurka for piano No. 1 in A flat major (1861-1884). Mazurka for piano No. 2 in C sharp minor (1861-1884). Russia (Rus'), Second Overture on Russian Themes, for orchestra, Symphonic Poem (1863-1864, revised 1884). Jota aragonesa for Piano (after Glinka) (1864). "The Lark" ("Zhavronok") for piano, transcription from a song by Glinka (1864). Symphony No. 1 in C major (1864-1866). Overture on Czech Themes "In Bohemia" ("V Chechii"), Symphonic Poem, (1867, revised 1905). Au jardin, étude-idylle for piano in D flat major (1884). In the Garden, for piano (1884). Mazurka for piano No. 3 for Piano in B minor (1886). Mazurka for piano No. 4 for Piano in G flat major (1886). Nocturne for piano No. 1 in B flat minor (1898). Mazurka for piano No. 5 for Piano in D major (1900). Scherzo for Piano No. 2 in B flat minor (1900). Waltz for Piano No. 1 in G major "Valse di bravura" (1900). Waltz for Piano No. 2 in F minor "Valse mélancholique" (1900). Symphony No. 2 in D minor (1900-1908). Berceuse for Piano in D flat major (1901). Gondellied, for piano in A minor (1901). Nocturne for piano No. 2 in B minor (1901). Tarantella for Piano in B major (1901). Waltz for Piano no 3 in D major "Valse-impromptu" (1901). Capriccio for piano in D major (1902). Mazurka for piano No. 6. For Piano in A flat major (1902). Nocturne for piano No. 3 in D minor (1902). Spanish melody for Piano (1902). Spanish Serenade for Piano (1902). Toccata in c-sharp for Piano (1902). Waltz for Piano no 4 in B flat major "Valse de concert" (1902). Cantata on the Inauguration of the Glinka Memorial (dedicated to Mikhail Glinka), chorus and orchestra (1902-1904). Humoresque for Piano in D major (1903). Phantasiestück, for piano in D flat major (1903). Rêverie, for piano in F major (1903). Waltz for Piano No. 5 in D flat major (1903). Waltz for Piano No. 6 in F sharp minor (1903-1904). Romance (transcription for piano solo of the second movement of Chopin’s first concerto for Piano and Orchestra, opus 11) (1905). La fileuse for Piano in B flat minor(1906). Mazurka for piano No. 7. For Piano in E flat minor (1906). Novelette for Piano in A major (1906). Waltz for piano No. 7 in G sharp minor (1906). Impromptu for piano (after Chopin's Preludes in E flat minor and B major) (1907). Esquisses (Sonatina) for Piano in G major (1909). Overture on the Themes of 3 Russian Songs, for orchestra. "Say not that love will pass" for piano, transcription from a song by Glinka. "Spanish Song" ("Ispanskaya pesnya"), for voice and piano (Forgotten Songs No. 3) (1855). "The Clear Moon has Risen" (1858). "The Knight" (1858) (20 Songs, No. 7). "Song of Selim" ("Pesnya Selima") (1858) (20 Songs, No. 11). "Hebrew Melody" (20 songs, no. 13) (1859). "Over the Lake" ("Nad ozerom"), song for voice and piano (1895-1896) (10 Songs, No. 1). "The Wilderness" (10 songs, no. 2) (1895-1896). "I Loved Him" ("Ya lyubila ego"), song for voice and piano (10 Songs 1895-96, No. 5). "The Pine Tree" (1895-1896) (10 Songs, No. 6). "Nocturne" (1895-1896) (10 Songs, No. 7). "Vision" ("Son") (10 Songs, No. 2) (1903-04). "7th November" (10 Songs, No. 4) (1903-04). "The yellow leaf trembles" ("Pesnya: Zholtďy list") (10 Songs, No. 8) (1903-04). "Look, my Friend" ("Vzglyani, moy drug") (20 Songs, No. 6) (1903-04). "The Dream" ("Son") (20 songs, no. 20) (1903-04). "Song: The Yellow Leaf Trembles" (1903-04). "My Heart Is Torn" ("Tak i rvetsya dusha"), song for voice and piano (20 Songs, No. 9). "Selim's Song" ("Pesnya Selima"), for voice and piano (20 Songs, No. 11). "The Crescent Moon" ("Vzoshol na nebo mesyats yasnïy"), song for voice and piano (20 Songs, No. 5). "Thou Art So Capitvating" ("Tï plenitel'noy negi polna"), song for voice and piano (Forgotten Songs, No. 1). "Toujours, on me dit 'grand sot'." "When I Hear Thy Voice" ("Slïshu li golos tvoy"), song for voice and piano (20 Songs, No. 18). This page was last modified on 24 September 2016, at 18:43.